Walking our dogs is one of the joys of life. We watch them run and play. We wonder at the power of their noses, as they follow the scent of an unseen rabbit. We get exercise and, most importantly, we enjoy time just being together. But what about when we can’t walk our dogs? They might be injured or ill, with instructions for limited, or even no, exercise for a period of time. Sometimes they need to rest an injury, or allow stitches to heal, or protect other dogs from infection. But if our vet tells us our dog needs “crate rest”, or to be “kept quiet” for days or even weeks, it can feel like we have an impossible task ahead. Sometimes we are ill or injured, so we can’t continue with our normal routine. This happened to me a few years ago. I was unexpectedly hospitalized for emergency surgery and told I couldn’t walk my dogs for 6 weeks! Even with help, this really disrupted my dogs’ normal routine. And when our dog is anxious or reactive, walks can be stressful for them. It can be a good idea to take regular days off walking, to allow your dog to relax fully and to let stress levels (yours and theirs!) go down. So what can you do to help your dog enjoy the days when walking isn’t an option? Here are 5 ideas to keep your dog entertained and content at home that only use what you already have in your cupboards or garage, along with some treats or your dog’s food. Recycle the recycling to make home-made puzzle toys and brain games. Hide treats in a cardboard tube with the ends bent inwards, or use plastic milk bottles, ice-cream tubs and egg boxes – cut some holes in the side if needed – and place a few treats inside. You can make these more challenging by hiding one inside a larger container – but always build up slowly. You want it to be easy for your dog to start. Sprinkle treats on an old towel or t-shirt, roll it up and teach your dog to unroll it to find the treats. Start with one or two treats along the edge and encourage him to push it with his nose to get the first treats. Gradually hide the treats deeper and deeper inside, as he gets the hang of it. Scrunch up pieces of paper into tight balls and use them to fill a low box to create your own ball pit. Scatter some tasty treats in amongst the paper balls. Your dog will love snuffling in the ‘ball pit’ to find the food. Get three or four yogurt pots or paper cups and place them upside down on the floor. Put a treat under one and ask your dog to find it. As always, start simple by letting your dog see you hide the treat. Once they are confidently finding that, you can move on to hide treats unseen and even move your pots around, once the treat is placed. 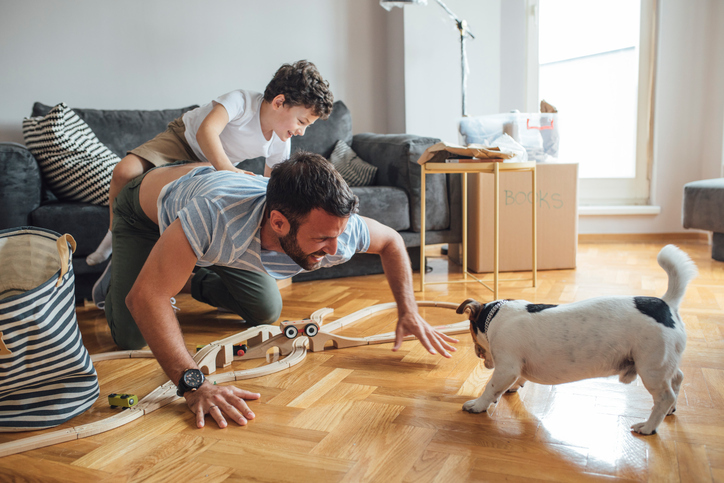 Set up a simple obstacle course in the house or yard, using bits and pieces from your garage. You can use poles or bamboo canes to step over and different surfaces, like carpet, plastic, rubber and wood, to walk on. Plant pots are great to weave around, and planks or boards to walk over. Keep everything low to the ground and encourage your dog to move slowly and mindfully around the course, on a lead if needed. We use exercises like this in TellingtonTTouch to improve balance and body awareness, and you will find that your dog is tired after just a short time working, because of the mental processing involved. For all of these, be interactive as you work with your dog. Encourage him to experiment and work out what he needs to do. Work at your dog’s pace and make sure he gets rewarded for thinking it through, rather than simply using brute force to get what he wants! All of these activities can be kept quiet enough for recuperating dogs but have enough stimulation to be satisfying for them. Remember that mental exercise is at least as important as physical exercise in tiring your dog – and after a good session doing these kinds of activities, your dog will be relaxed and ready for a sleep. Note: You can use any materials that are safe for your dog, but make sure you check for sharp edges and remove plastic rings or small choking hazards first. Always supervise these activities. 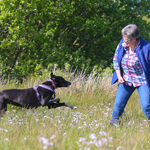 Janet Finlay is a TellingtonTTouch Practitioner, Dog Trainer and Human Coach, based in Yorkshire in the UK. She specializes in working with reactive dogs and their guardians by addressing tension and anxiety at both ends of the lead. She runs the online Canine Confidence Club (www.canineconfidenceclub), which provides information, education and support to members all over the world. You can find out more about Janet and her work – and get her free online courses on TTouch and coping with reactivity at www.canineconfidenceacademy.com.